Reading and share top 95 famous quotes and sayings about Export by famous authors and people. Browse top 95 famous quotes and sayings about Export by most favorite authors. 1. "My country's main exports are stolen cars and sadness." 2. "Now, the impact on export markets - we export about 10 percent of what we produce, so obviously that will probably have some impact on the market. At this point it's too early to determine how much." 3. "Fascism is not an article for export." 4. "With the canal, the cost of shipping a ton of flour from Buffalo to New York City fell from $120 a ton to $6 a ton, and the carrying time was reduced from three weeks to just over one. The effect on New York's fortunes was breathtaking. Its share of national exports leaped from less than 10 percent in 1800 to over 60 percent by the middle of the century; in the same period, even more dazzlingly, its population went from ten thousand to well over half a million." 5. "Well, the way things are going, aside from wheat and auto parts, America's biggest export is now the Oscar." 6. "For us to grow globally, it's not enough to just be an exporter. We have to be a creator." 7. 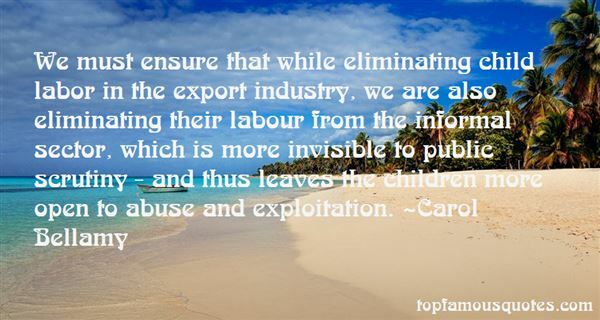 "We must ensure that while eliminating child labor in the export industry, we are also eliminating their labour from the informal sector, which is more invisible to public scrutiny - and thus leaves the children more open to abuse and exploitation." 8. "I had learned what wealth was, and a great deal about production and exchange for myself in the early history of South Australia - of the value of machinery, of roads and bridges, and of ports for transport and export." 9. "If my father's business hadn't gone broke, I'd be exporting nuts, bolts and sugar machinery right now. What an awful thought!" 10. "We need the Chinese to - you know, spend more, save less - consume more and not be so focused on exports. There are big changes we need in the world." 11. "The US exports democracy, hence there being very little left for Americans"
12. "The boomerang is Australia's chief export (and then import)." 13. "Any editing, software work, and mail is done in this exported Plan 9." 14. "His mouth is for export and his head has no entrance." 15. "Even though it is the case that poverty is linked to AIDS, in the sense that Africa is poor and they have a lot of AIDS, it's not necessarily the case that improving poverty - at least in the short run, that improving exports and improving development - it's not necessarily the case that that's going to lead to a decline in HIV prevalence." 16. "Creativity is an import-export business." 17. "In principle, there are only three main components of spending that much matter to monetary policy: consumer spending, business investment and exports and trade." 18. "Is France a northern European export powerhouse, or a Mediterranean indebted and dependent economy? Yes to both." 19. "I get a bit of a kick out of exporting private enterprise and incentives." 20. "Malone: Me father died of starvation in Ireland in the black 47. Maybe you've heard of it.Violet: The Famine?Malone: No, the starvation. When a country is full o food, and exporting it, there can be no famine." 21. "Engineering undergraduates should not be charged fees. They should receive grants, not student loans, and the government will get the money back long-term from increased exports." 22. "All images generated by imaging technology are viewed in a walled-off location not visible to the public. The officer assisting the passenger never sees the image, and the officer viewing the image never interacts with the passenger. The imaging technology that we use cannot store, export, print or transmit images." 23. "Obviously any export of uranium to India could only occur within an appropriate international framework to be negotiated by the commonwealth government." 24. "Princes always are always happy to see developing among their subjects the taste for agreeable arts and for superfluities which do not result in the export of money. For quite apart from the fact that with these they nourish that spiritual pettiness so appropriate for servitude, they know very well that all the needs which people give themselves are so many chains binding them. When Alexander wished to keep the Ichthyophagi dependent on him, he forced them to abandon fishing and to nourish themselves on foods common to other people. And no one has been able to subjugate the savages in America, who go around quite naked and live only from what their hunting provides. In fact, what yoke could be imposed on men who have no need of anything?" 25. "Almost 70 percent of U.S. ag exports travel the upper Mississippi River and the Illinois waterway system." 26. "All those trucks and barges that carry our goods to port are vital connections to the only force which can balance our trade deficit: export. We must keep doing what we do best if we are going to get America out of the red." 27. "People forget that a huge proportion of our jobs still depend on agricultural production in Australia so of course there are exports. That's easily overlooked." 28. "Jesus came into the world with good news, not bad news. He does not call us to a willpower religion that feels only duty and no delight. He calls us to himself and to his Father. 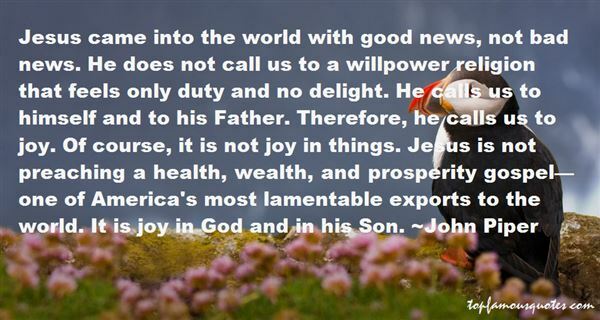 Therefore, he calls us to joy. Of course, it is not joy in things. Jesus is not preaching a health, wealth, and prosperity gospel—one of America's most lamentable exports to the world. It is joy in God and in his Son." 29. 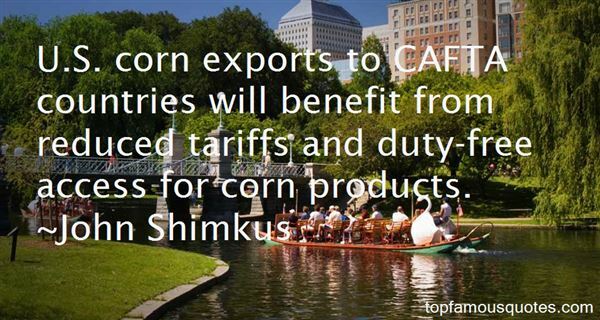 "U.S. corn exports to CAFTA countries will benefit from reduced tariffs and duty-free access for corn products." 30. "Worse there cannot be; a better, I believe, there may be, by giving energy to the capital and skill of the country to produce exports, by increasing which, alone, can we flatter ourselves with the prospect of finding employment for that part of our population now unemployed." 31. "At the present moment the people of England are only three-quarters fed, and the result of this improvement in the export of our manufactures would be, that they would be entirely fed." 32. "But it's not just the cattle producers, it's all the attendant industries like transport and shipping and feed producers and the like. There will be enormous ramifications across the beef industry generally as a result of the Government's decision to ban all exports to all of the abattoirs in Indonesia." 33. "America is becoming more and more dependent upon imports from foreign manufacturers than we are exports from our country in all fields: in appliances, in clothing, even food. This year America may become for the first time in its history a net food importer." 34. "Does it truly make a difference how I'm alive?" I asked him. But he didn't answer. I walked over to where Hayden stood, resting my hand on his. I looked at the photo he held before making my way along the wall. Every photo was of our family. The family that existed before the accident. The family that existed before I was struck by a car. I wasn't supposed to remember it, but I did. When they exported my memories and my life from my body, every trace of the accident was supposed to be erased. But it still remained. You can't erase death. That was what Hayden was trying to tell me. No matter how much he wanted to forget, he couldn't." 35. "In brief, Western democracy, as other political models, is not exportable to all regions of the world." 36. "When I look at how the banking world has changed and at the role Chinese banks, for example, play today, Germany, as an export-oriented economy, should be pleased to have a major global player in its camp." 37. "Sardar Harbans Singh passed away peacefully in a wicker rocking-chair in a Srinigar garden of spring flowers and honeybees with his favourite tartan rug across his knees and his beloved son, Yuvraj the exporter of handicrafts, by his side, and when he stopped breathing the bees stopped buzzing and the air silenced its whispers and Yuvraj understood that the story of the world he had known all his life was coming to an end, and that what followed would follow as it had to, but it would unquestionably be less graceful, less courteous and less civilized than what had gone." 38. "One of Scotland's most important cultural exports - stories." 39. "Goods are traded, but services are consumed and produced in the same place. And you cannot export a haircut. But we are coming close to exporting a haircut, the appointment part. What kind of haircut do you want? Which barber do you want? All those things can and will be done by a call center far away." 40. "Socialism is a wonderful idea. It is only as a reality that it has been disastrous. Among people of every race, color, and creed, all around the world, socialism has led to hunger in countries that used to have surplus food to export.... Nevertheless, for many of those who deal primarily in ideas, socialism remains an attractive idea -- in fact, seductive. Its every failure is explained away as due to the inadequacies of particular leaders." 41. "There needs to be more pressure on the Mexican government to stop the drugs and illegal immigrants on their side of the border instead of exporting them to the U.S."
42. "The Scottish government set a goal of increasing exports by 50% by 2017. That is ambitious. Is it achievable?" 43. "In 2011, agricultural exports hit a record high and producers saw their best incomes in nearly 40 years." 44. "The direct investment of Japanese businesses to East Asian economies accelerates the reallocation of their production bases. Consequently, between Japan and the other East Asian countries, both exports and imports are growing substantially." 45. "China's idea of fair trade is government subsidies of its textile and apparel exports to the United States, currency manipulation, and forgiveness of loans by its government banks." 46. "This was the period when I used all the influence I had to get the British to abandon their export trade, and as much as possible convert all of their manufacturing facilities to the immediate needs of the war, including civilian, as well as military requirements." 47. "Laughter is America's most important export." 48. "Months earlier, Apple had gotten the right to export computers to China,"
49. "The German export successes are not the result of some sort of currency manipulation, but of the increased competitiveness of companies. The American growth model, on the other hand, is in a deep crisis." 50. "I think Americans should have a policy of love. That should be the foreign policy, love. Export Love." In looking back now, I see how it began in my childhood, altho' I was not conscious of the necessity until '67 or '68 when I broke down first, acutely, and had violent turns of hysteria. As I lay prostrate after the storm with my mind luminous and active and susceptible of the clearest, strongest impressions, I saw so distinctly that it was a fight simply between my body and my will, a battle in which the former was to be triumphant to the end....So, with the rest, you abandon the pit of your stomach, the palms of your hands, the soles of your feet, and refuse to keep them sane when you find in turn one moral impression after another producing despair in the one, terror in the others, anxiety in the third and so on until life becomes one long flight from remote suggestion and complicated eluding of the multifold traps set for your undoing."